side dish flavored with chilies and lemon juice. Three weeks ago, I used this column for the self-indulgent purpose of marking my 25th wedding anniversary, noting the culinary stability my husband provides our marriage through his faithful barbecuing of chicken, Guam-style. I received some good wishes in response, but more than that, many requests -- or, rather, demands -- for his recipe. As you'd expect, however, his recipe was never written down, he never measured anything and it was like pulling teeth to get him to go through the process. But I pulled them, and so here we are. In celebration of Guam's Liberation Day, we offer the recipe, with this caveat: Your chicken probably won't taste exactly like his chicken, as the art is not in the recipe, but in the barbecuing, and that's hard to explain in writing. No matter. Unless you are a very lousy griller, your results should be good and chances are you've never had his chicken anyway, so what's to compare? That's more or less what Rob told me as he poked holes in the underside of the chicken thighs before inserting them in his marinade. "I don't know if this does anything, but with barbecuing it's all in the ritual." Moving on: This style of barbecue is lemony, just a little spicy and very smoky. You have to use a charcoal grill (well, it's not written in the law, but if you insist on gas, you're on your own). The heat must be kept high, so if you're barbecuing in batches, you'll need to add coals and stir them around. You'll also have to move the chicken pieces around, to take advantage of the hot spots on the grill and keep everything cooking evenly. You'll be creating a lot of smoke, so don't try this on the balcony of an apartment, and allow time for a shower afterward. Also: Use fresh lemons, but not fresh garlic. Rob always uses the pasty crushed garlic sold in jars. This bugs me, but you can't argue with success. Use the blade of a machete or an ax and tap the coconut all around its circumference. Keep turning the coconut and tapping it until it splits. Insert the tip of a sharp knife between the meat and the shell to pry out chunks of meat. Add thigh pieces, piercing the meaty side with a fork (don't pierce the skin side). Add pieces one by one, turning each one to coat and leaving it skin-side-down in marinade. Add drumsticks on top of thighs. Press down on meat so all pieces are submerged. Cover and refrigerate at least 6 hours, or overnight. Prepare a hot charcoal grill. 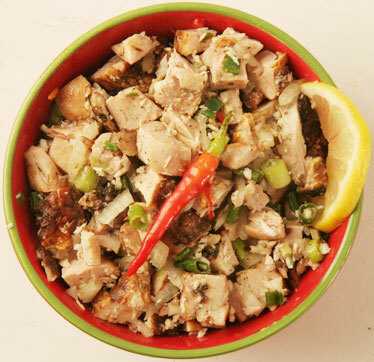 Remove chicken from marinade and place on grill (if you're working in batches, grill thighs first). When coals begin to flame, cover grill. Grill chicken about 15 minutes on one side, removing cover when heat subsides enough that flare-ups cease. Dip pieces in marinade and return to grill. Turn again after 15 minutes and check for doneness (cut into one piece). Continue grilling and turning chicken pieces, moving them around the grill so the most underdone pieces are in the hottest spots, until cooked through. Serves 12. Approximate nutritional analysis, per serving: 570 calories, 84 g fat, 10 g saturated fat, 230 mg cholesterol, greater than 2,000 mg sodium, 6 g carbohydrate, 1 g fiber, 2 g sugar, 56 g protein. Kelaguen is a traditional side dish that can be made with raw fish (like ceviche, the fish "cooks" in the lemon juice), raw slices of beef (same principal) or cooked crab or shrimp. The standard, though, is mannok, or chicken. This recipe comes from Serafina Sanchez, a former caterer on Guam who now works in Honolulu for Guam Medical Referral. She'd normally start with five whole chickens and assemble the dish by taste, not measurement, so she estimated this small-quantity recipe over the phone. It squares with those you'll find in Guam cookbooks. For best results, you'll want to use the optional grated coconut, although Sanchez says she usually doesn't. Fresh coconut spoils easily, so the dish would have to be kept chilled, she said. And working with a whole coconut can be a lot of trouble. A good alternative, though, is frozen grated coconut from the Philippines. Look for it in Asian markets. I found a bag at Pacific Supermarket in Waipahu. Debone chicken and remove most of the skin. Cut meat into 1/2-inch chunks. If chicken is still warm, let cool before continuing. Chicken may be prepared to this point a day ahead and refrigerated. Combine with remaining ingredients, adding lemon juice last, to taste. Serves 8 to 10. 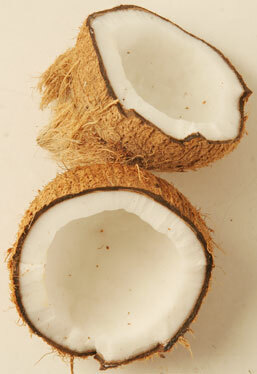 Note: If using coconut, keep dish cold at all times or the coconut will spoil. Approximate nutritional analysis, per serving (without coconut or salt to taste): 210 calories, 6 g fat, 1.5 g saturated fat, 135 mg cholesterol, 150 mg sodium, 5 g carbohydrate, 1 g fiber, 2 g sugar, 32 g protein. Approximate nutritional analysis, per serving (with optional coconut but not including salt to taste): 350 calories, 20 g total fat, 13 g saturated fat, 135 mg cholesterol, 150 mg sodium, 11 g carbohydrate, 4 g fiber, 5 g sugar, 34 g protein. Red rice is actually more orange, the color coming from achiote -- also called achote, achuete and annatto. It's a tiny red seed familiar in Latin and Filipino cooking. Although it looks fiery -- and so does the resulting rice -- the flavor is mild and not at all spicy. This recipe comes from my mother-in-law, Beatrice Calvo Perez, who makes the best red rice in the family. She relies on the finger method of measuring the water in a rice cooker, a technique used in Hawaii and Asia (note the instructions below). It works with any size finger, by water displacement, or perhaps magic. 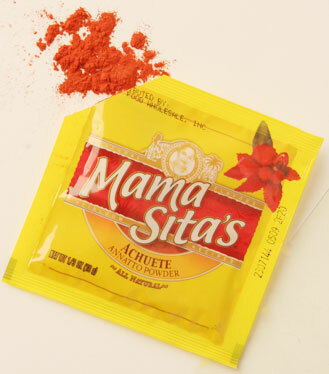 Ground annatto seeds are sold in 1/3-ounce packets in the Asian section of supermarkets with the Filipino seasonings. Put all ingredients in an 8-cup rice cooker. Insert index finger straight down so it's touching the surface of the rice. Add water so that liquid reaches first joint of index finger (about 2 cups). Stir. Start rice cooker. Halfway through cycle, stir rice. Serves 12. Approximate nutritional analysis, per serving (not including salt to taste): 300 calories, 5 g total fat, no saturated fat or cholesterol, 350 mg sodium, 56 g carbohydrate, 2 g fiber, 1 g sugar, 5 g protein.